Fair elections the only viable answer to the crisis. Amateurish explosives set off by unknown culprits endanger human lives and the government blames everyone else except its own inefficiency. Tax evasion is galloping while the Parliament spends one and a half day discussing how they will vote about the possible criminal actions of a former finance minister and his alleged covering up of afore mentioned tax evasion. Unemployment skyrockets while EU funding for jobs goes unclaimed. Racist attacks continue unabated: the last straw was the murder of a Pakistani immigrant on his way to work. The two young Greek perpetrators, according to news broadcasts, claim they killed him because he blocked their way! It is no wonder so many young people immigrate. One can struggle against poverty, unemployment, heavy taxation, criminality but one needs hope to do so and this does not seem to come from any quarter. Greek public opinion blames politicians for all the evils that have befallen the country. Ms. Merkel comes a very close second. On the other hand no one sees the Greek people’s part of the problem: we have contributed to this situation and we have contributed greatly. This grim truth needs to be stated and a new political personnel, which will not carry the stain of being part of the problem, needs to be elected. We need fair elections, a government that will convince us they mean to practice what they preach and then we may have a chance to turn things around. Until that happens survival is the order of the day. Antonis Samaras, President of the right wing New Democracy party, spoke tonight in Thessaloniki, in Velidion Conference Center. His speech was awaited with great interest because it came right after a brief phone discussion with Finance Minister Evangelos Venizelos. The focus of his speech was on the need for elections and the rejection of any form of coalition government. He asked for a “strong government” after the elections. He started his speech saying: “last year I spoke about what I planned to do. This year I am telling you what I am going to do”. Among his proposals was a re-negotiation of the Memorandum, a tax cut for both businesses and working people, faster privatisations, better use of the country’s natural resources, constitutional reforms and a war against bureaucracy to promote investments. The audience was so large that the podium had to be moved to accommodate television broadcasting. The slogan behind Mr. Samaras was “Greeks can” in English and the same phrase was repeated in his speech innumerable times. Nothing is ever easy in the country that gave birth to tragedy. After all we have a reputation to live up to. Local government elections took place yesterday- November 7 2010- but some of the largest municipalities and regions are still undecided so there is another round next Sunday. In order for a Mayor to be elected on the first Sunday he/she has to get 50% plus one vote. The first round winners are a minority which means that next week most people will be voting again. The unanimous decision on television panels is that the winner of this round was abstention followed by the Communist Party of Greece. Disillusioned voters and great, sunny weather on a Sunday are not a good advocate to give up an outing to go to the polls. On the other hand, the Communist Party was the only party which went to the polls without any allies, presenting its own candidates and all its lists under the same name “Laiki sispirosi” – the people’s alliance. This, together with the fact that since it’s never been in government it cannot be blamed for the present disastrous position of the country, led to its increasing its vote considerably all over the country. The political leaders claimed that a. they retained the larger part of their power, b. their party managed to close the gap between the first party and itself, c. the other parties do not see the “message” the voters meant to send! In reality the central government refuses to give the local government authorities, both municipal and regional, the necessary funds to carry out the tasks that are supposed to be theirs. The second round of the local authorities was held on 14 November 2010 and had two big surprises: Athens municipality was won by the PASOK and Democratic Left candidate Mr. Kaminis. The surprise is that the New Democracy had the government of the metropolis for more than twenty years. While there is an area in central Athens where there are grave incidents against the immigant population and where the neonazis got a majority the rest of the population showed a remarkable maturity. In Thessaloniki a 75 year old ear wearing wine maker was elected despite the pronounced disapproval of the local Bishop Anthimos (well known for his nationalist views ). Mr. Boutaris is also a chain smoker, which makes him a kind of a hero at the present time. Unfortunately the big winner was abstention!! For the first time abstention reached a 60% level and caused concern. Politics and politicians are looked down upon as no more than common frauds ( I am being polite here) and the electorate has lost all trust in them. It is 8.15 pm in Athens and the voting polls have closed since 7pm. Results are coming in very slowly and the first winner is abstention!!! Voting has been a civic obligation, safeguarded by the constitution. People who abstained from voting were punished. This law has become inactive for a few years and abstention has risen, especially among the young. These elections introduce a new local authority that did not exist in Greece: that of regions. To be precise this rank of local authority existed but was appointed, now the Heads of the regions will be elected. Another special feature of these elections was that the candidates were divided -roughly speaking – into those for and those against the Mnemonium (Mnemonium is the agreement signed with the IMF and the representatives of the EU). According to a poll presented just now on a private TV channel the majority of the Greek people are now convinced that this agreement was not necessary. The New Democracy party (right wing, neoliberal), SYNASPISMOS – Coalition of the Radical Left, the Communist party form the anti – mnemonium “block”. PASOK, the ruling social democratic party, LAOS = Popular orthodox rally, an ultra right, populist, xenophobic and racist party and the Democratic Left, a Eurocommunist party, form the block that considers the Mnemonium as a necessary evil. The PASOK (social democratic party) list is headed by Mr. Sgouros, former prefect. 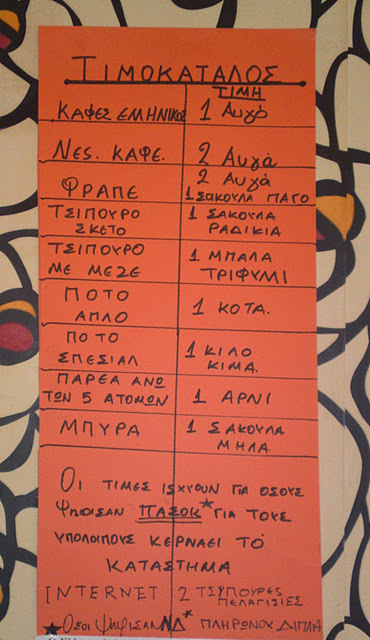 The Greens list is headed by Mr. Diakos.